Teaching grammar within the context of Second Language Acquisition (SLA) needs both product and process approaches. Microteaching is one of the techniques to prepare students teachers to improve their skills in this area. One of the microteaching lessons in English Language Education Department, Teachers College Universitas Pelita Harapan, is called Planning, Strategy, Assessment, and Learning (PSAL) Grammar. In this class, students are exposed with the nature, principles, and strategy of teaching and learning grammar. Students are planning lessons related to teaching grammar in various grades as well as developing teaching and learning material and instrument for language assessment. Students then put them into practice in the classroom individually. Discussion on the students ‘performances will be conducted after the microteaching session. This research aims to analyze students’ skills in teaching grammar in microteaching class as well as the discussing the strength and challenges arise. The type of the research is a qualitative case study research. The data collection techniques being used are observation, reflective journal, and Focus Group Discussion (FGD). Moreover, the technique of analyzing the data was Miles and Huberman concept of data reduction, data presentation, and conclusion drawing. The results of this research will be presented in a descriptive-narrative manner by describing and discussing students’ skills in teaching grammar. Al-Mekhlafi, (2011). Difficulties in Teaching and Learning Grammar in an EFL Context. International Journal of Instruction 4 (2): 69-92. e-ISSN: 1308-1470. Kyriacou, C. (2007) Essential Teaching Skills, 3rd ed. Cheltenham: Nelson Thornes Limited. Mulyana, D. 2010. 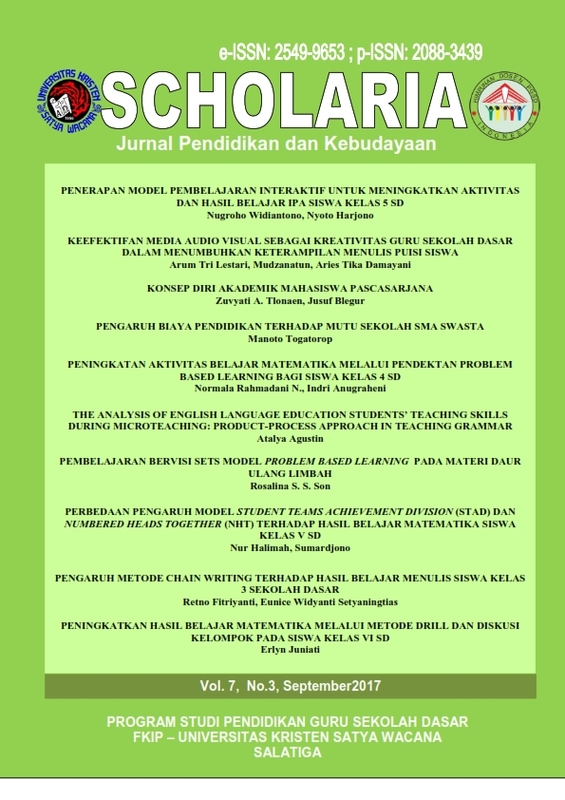 Metodologi Penelitian Kualitatif: Paradigma Baru Ilmu Komunikasi dan Ilmu Sosial Lainnya. Bandung: PT. Remaja Rosdakarya. Literature. Middle-East Journal of Scientific Research 22 (6): 789-795. ISSN 1990-9233. Thornbury, Scott. (2001). Uncovering Grammar. Oxford: Macmillan Heinemann.